Alberto Ayala is the Air Pollution Control Officer and Executive Director of the Sacramento Metropolitan Air Quality Management District. Governed by a 14-member Board of Directors, the Sac Metro Air District provides regional leadership for protecting public health and the environment from the adverse effects of air and carbon pollution and implements economically sensible policies for achieving the state’s air quality and climate goals. Alberto came to the Air District from the California Air Resources Board, where he served most recently as Deputy Executive Officer. Prior to CARB, Alberto was a member of the engineering faculty at West Virginia University, where he still holds an Adjunct Professor appointment, and a Design Engineer for Teledyne Ryan Aeronautical. He has published extensively in scientific journals, is a nationally and internationally recognized speaker, and occasionally lectures in English or Spanish as a Visiting Professor in the U.S. and abroad. 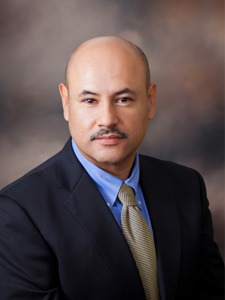 Alberto holds B.S., M.S.E., and Ph.D. degrees in mechanical engineering from the University of California, Davis. His internships were with GE’s Corporate Research Center in New York, the California Energy Commission, and the Atmospheric Boundary Layer Wind Tunnel Laboratory at UC Davis.